In December 2018, a series of interpretive signs have been installed at the historic mills that dot the valley of the Jones Falls. The signage project, funded in part through a BNHA small capital grant, goes beyond the buildings’ architecture and history and dives deeply into the people who worked in the mills and lived in the nearby communities. In 2017, Preservation Maryland was awarded $14,000 from BNHA’s Small Capital Grant program for the research, design, and fabrication of the eight signs. Preservation Maryland raised additional funds for the $28,000 project. Prominently located at the mill sites -- Meadow Mill, Whitehall Mill, and Mill Centre among others – the signs bring the mill history alive and connect directly to the thousands of residents and visitors who travel to the mill valley buildings to work, play, and live. Attractive historic photography and illustrations capture interest, and online resources encourage additional learning about Baltimore’s early industrial heritage. Nathan Dennies of the Greater Hampden Heritage Alliance served as the lead researcher for the project. Preservation Maryland worked with local preservation advocacy organization Baltimore Heritage, Inc. to bring the signage content online. Visit explore.baltimoreheritage.org/jonesfalls for more information about the historic resources in the Jones Falls valley. 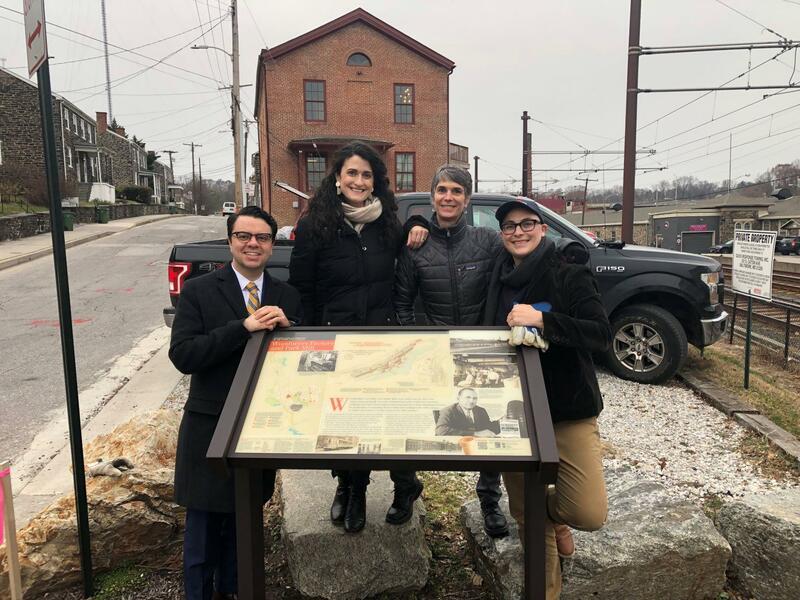 Preservation Maryland's Nicholas Redding, Elly Cowan, Jana Carey, and Meagan Baco stand at one of the signs that interprets the history of the Jones Falls and the mills that powered Baltimore's early industrial heritage.